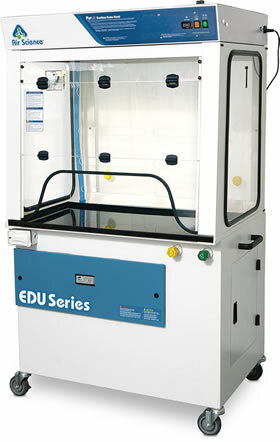 The EDU™ Series Ductless Demonstration Fume Cupboards are designed for individual and group applications where clear front, side and rear walls permit 360° visibility. The high efficiency carbon filtration and air management system found in these fume cupboards protects both the user and the classroom environment from hazardous vapors generated on and above the work surface. 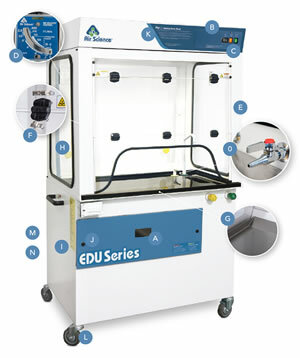 The EDU Series filtering fume cupboard units are mounted on heavy duty transfer carts and are sized to fit through standard doorways for easy transportation from lab to lab. 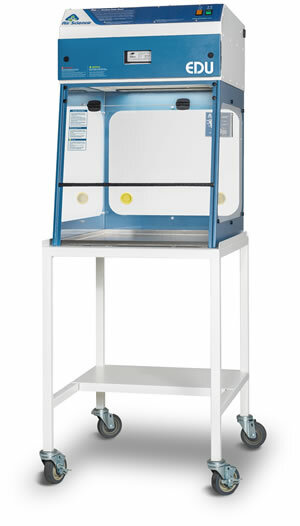 Portable ductless fume cupboard with transparent front, back and side walls for maximum visibility. 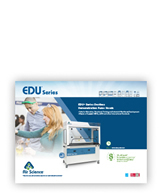 The EDU Series offers personnel and environmental protection, optimal energy savings and zero toxic emissions to the room. A. Filter I.D. Window: A convenient, strategically placed front cover window shows the installed filter part number and installation date to encourage timely filter replacement. B. Control Panel: Electronic controls and displays include switches for the blower and low airflow alarm. C. Airflow Alarm: Low airflow alarm continuously monitors filter loading and alerts used when service is needed. D. Air Velometer: An analog air velocity meter is positioned in the user's field of vision. E. Steel Support Frame: The chemical resistant epoxy coated steel frame adds mechanical strength. Optional all polypropylene construction is available if desired; see accessories. F. Hinged Front Sash: When closed, the cabinet sash protects the contents from inadvertent external contact and better isolates the air within. The sash is easy to open and close. G. Work Surface: The internal work surface is fitted with a standard polypropylene spill tray (available in white and black). An optional stainless steel tray is also available; see accessories. H. Pass Through Ports: Electrical cords and cables are safely routed into the cabinet through ports on the back. I. Electrostatic Pre-Filter: The electrostatic pre-filter is accessible from inside the chamber and 91% effective down to 1-3 microns. J. Filter Door Key: Filter access keys prevent unauthorized removal or accidental exposure to dirty filters. K. Internal Manual Speed Controller: Authorized personnel set the centrifugal fan motor speed as desired. 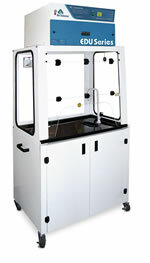 L. Locking Casters: Permit complete portability from lab to lab. The overall width and height are sized to fit easily through standard doorways. N. Quick Release Connections: For water, waste, and gas. O. Optional petcocks are available for gas and water. An optional gooseneck faucet is positioned over an optional chemically-resistant polypropylene sink cup integrated into the work surface. 360 Degree Visibility: Clear back and side panels allow ambient illumination into the chamber and provide users with an unobstructed view of its contents. Construction: All models are available in either metal or polypropylene construction. See selection chart for specifications and dimensions. Available in 120V, 60Hz and 230V, 50Hz models. No Installation, No Ducting Required: Self-contained, integrated systems ideal for fixed location or mobile applications. Safe, Energy-Efficient Operation: All conditioned air is safely returned to the room, minimizing impact on facility HVAC costs.